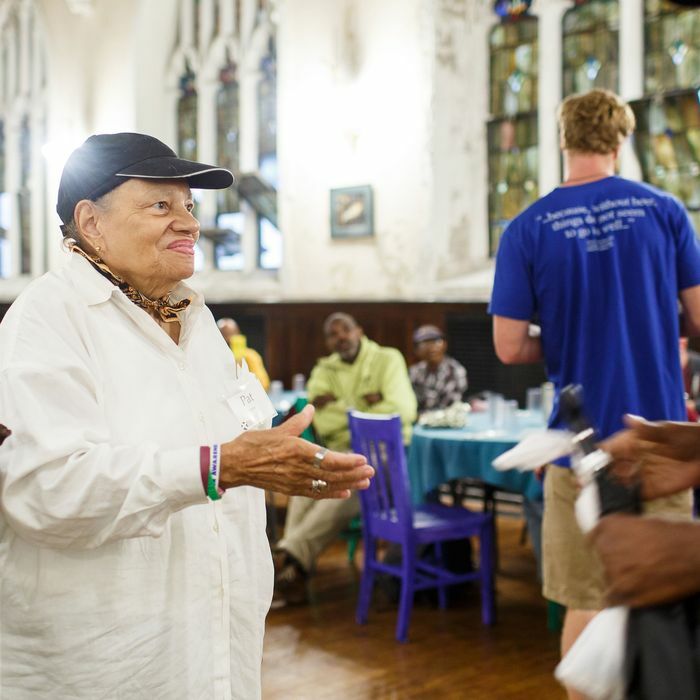 Pat Taylor, a volunteer with the dignity group, greets each guest as they arrive for dinner at the Broad Street Hospitality Collaborative. The difference is that none of the people eating Seibel’s food will pay a bill. The food is free because Seibel is the chef at Broad Street Hospitality Collaborative in Philadelphia, a charitable organization that practices the concept of “radical hospitality,” moving beyond the idea of a soup kitchen to create an environment that is more focused on providing both nourishment and dignity. Broad Street employees 22 full-time employees, like chef Seibel, and also depends on help from thousands of volunteers each year. Even with so many helping hands, it’s a huge job. 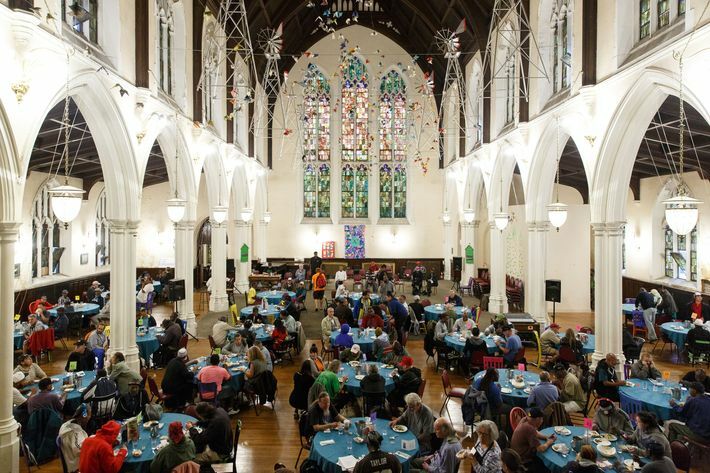 Last year, Broad Street served more than 76,000 meals to 7,600 separate guests. In the U.S. alone, 41.2 million people were considered “food insecure” in 2016, which is the term used for people who do not have access to a sufficient amount of food. With chefs and restaurateurs being elevated to celebrity status and wielding more influence than ever, it was only a matter of time before people in the food industry started using their clout to tackle food-related issues. 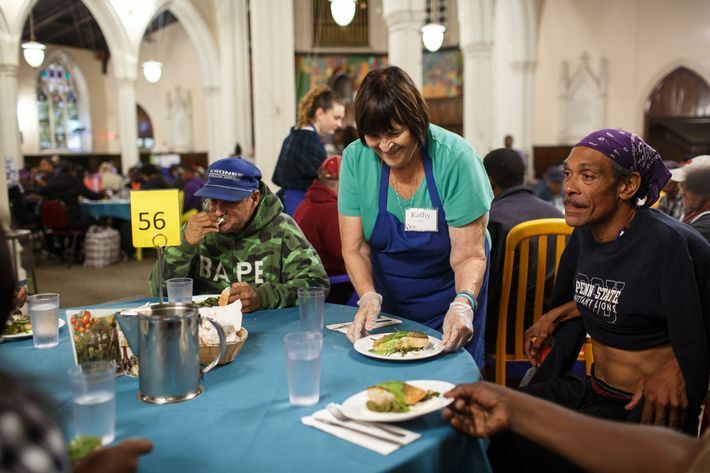 In fact, Broad Street is part of a growing international movement that values the power of hospitality to create charitable dining experiences, where the act of eating is about more than simple nutrition. “At Osteria Francescana, I learned how powerful the value of hospitality can be,” says Massimo Bottura, one of the most famous chefs in the world, talking about his three-Michelin-starred restaurant in Modena, Italy. 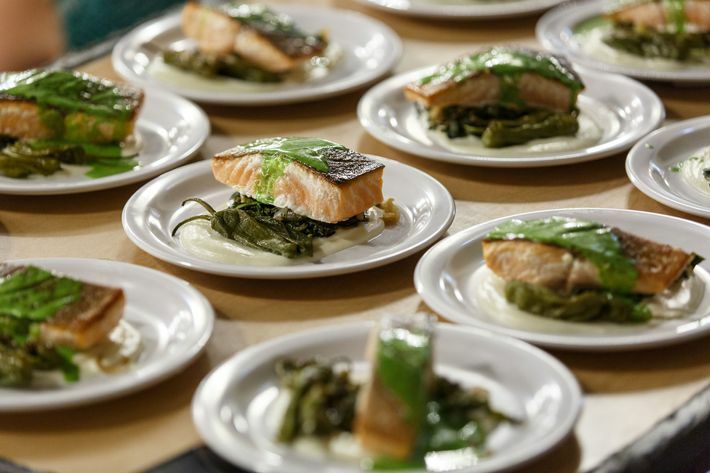 He and his wife, Lara Gilmore, have funneled their renown and resources into Food for Soul, a nonprofit that aims to feed vulnerable populations via what Bottura describes as “community kitchens,” with the support of other titans of the food world like Alain Ducasse and Daniel Boulud. Bottura has been able to use his considerable stature in the industry and public profile to garner both big donations from private donors and hands-on help from fellow chefs, food suppliers, artists, and hospitality experts. Using his extensive international connections, the organization is able to procure high-end ingredients that are perfectly safe, but which for any number of reasons would normally be destined for the garbage dump instead of the dining room. Using that food and a veritable army of trained staffers and volunteers, Food for Soul has been able to open serious dining rooms around the world that offer a real restaurant experience: Nutritious multicourse meals, made using the best ingredients, presented in well-appointed surroundings, and served by people with strong hospitality training. Can a Cooking Class Save Lives? While Broad Street and Food for Soul rely on donations, One World Everybody Eats takes a different approach. Their goal is to blur the lines between charity and hospitality so completely that OWEE–affiliated cafés — there are now almost 60 in the U.S. and one in the U.K. — are full restaurants accessible to every customer. OWEE got its start in 2003 when Denise Cerreta, who won this year’s James Beard Foundation Humanitarian of the Year award, decided to open a café next to her acupuncture studio in Salt Lake City. It struck her that she could better serve her community by allowing patrons to pay whatever they could afford for their meals, the generosity of most of her customers offsetting free meals for diners in need. It all speaks to the core values of these organizations. In reporting this story, nearly everyone used the same words over and over again: hospitality, dignity, and nourishment. By focusing on those tenants, they are able to create places that offer guests the same things everyone wants in a dining experience: to feel as though they’ve been served not out of obligation, but from a place of genuine care and concern, and to share a meal that is not just sustaining, but deeply enjoyable as well.